Developing a new manuscript (Box et al. submitted), I’ve managed to update the Box et al. 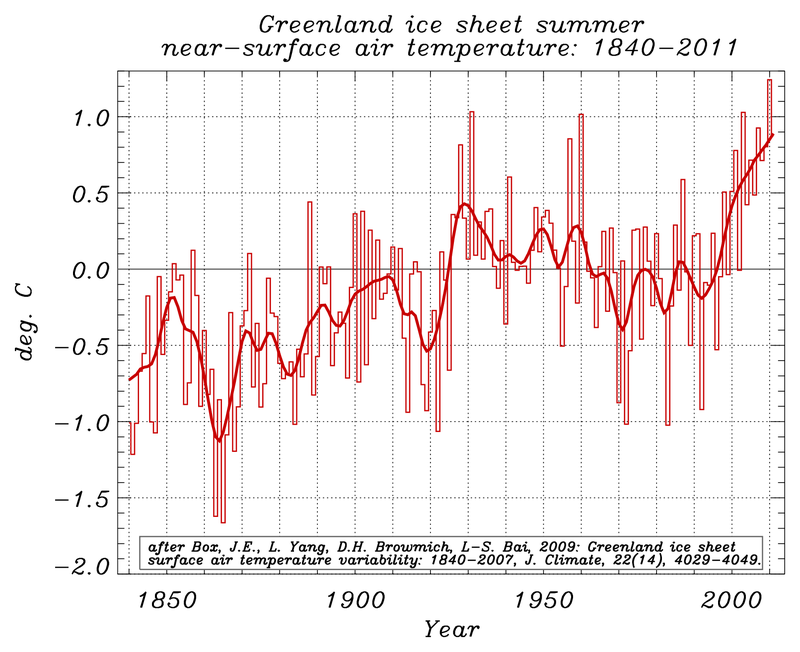 (2009) near-surface air temperature reconstruction and am struck after incorporating 4 more years, it seems little doubt that summer air temperatures for Greenland ice are the highest in at least 172 years. Summer temperatures in the late 2000s are roughly 0.5 C warmer than in the 1930s and even warmer than at any time since at least 1840s. Because the reconstruction captures the end of the Little Ice Age, it is further reasonable to think that Greenland probably hasn’t been as warm in summer than since the time the Norse colonized Greenland beginning in 982. Implications for the recent warmth are of course grabbing headlines. Temperature anomalies relative to the 1951-1980 average. While earlier studies (e.g. Chylek et al. 2006) ascribe significance to the fact that 1920s temperature increases were greater in magnitude since those after the early 1990s, this point lacks relevance because 1.) the 1920s trend was measured from the depth of an (unexplained) decadal cool period while the recent trend, i.e., measured beginning in 1994, after the 1991-1993 Mt. Pinatubo volcanic cooling and especially because 2.) the recent summer temperatures are ~0.5 C higher in absolute magnitude than those in the 20th century. During the ~63 year period (1930 to 1992) cooling prevailed that can be attributed partially to an increases in atmospheric aerosols that reduce surface insolation. Liepert et al (2002) estimated that there a global reduction of about 4% in solar radiation reaching the ground between 1961 and 1990. West Greenland is a focus of sulfate aerosol-induced cooling (Rozanov et al. 2002, Box et al. 2009). Cold episodes in 1983-84 and 1991-92 enhance this cooling trend and are caused by major volcanic eruptions (Box, 2002; Box et al. 2009). The cooling phase has also been attributed to the Atlantic Multidecadal Oscillation (AMO) (e.g. Schesinger et al. 1994). Though, it remains unclear whether AMO is a recurrent harmonic oscillation or just a hiatus of warming caused by sulphate cooling. The post-1994 warming, is attributable to: 1.) a growing absence of sulfate cooling because there has not been a major volcanic eruption since at Mount Pintubo in 1991; 2) a reversal of the global dimming trend (Wild et al. 2009); and 3) ongoing and intensifying anthropogenic global warming (AWG) owing to a dominance of enhanced greenhouse effect despite various anthropogenic cooling factors such as aerosols and contrails (IPCC, 2007). Year 2010 annual surface air temperature observations around west and south Greenland exceeding 3 standard deviations from the 1901-2000 century baseline. Box, J.E., L. Yang, D.H. Browmich, L-S. Bai, 2009: Greenland ice sheet surface air temperature variability: 1840-2007, J. Climate, 22(14), 4029-4049, doi:10.1175/2009jcli2816.1. Box, J..E., Greenland ice sheet mass balance reconstruction. Part II: Surface mass balance (1840-2010), J. Climate, submitted 30 July, 2012. Chylek, P., M. K. Dubey, and G. Lesins, 2006: Greenland warming of 1920–1930 and 1995–2005, Geophys. Res. Lett., 33, L11707, doi:10.1029/2006GL026510. Rozanov, E. V., and Coauthors, 2002: Climate/chemistry effects of the Pinatubo volcanic eruption simulated by the UIUC stratosphere/troposphere GCM with interactive photochemistry. J. Geophys. Res., 107, 4594, doi:10.1029/2001JD000974. Wild, M., B. Trüssel, A. Ohmura, C. N. Long, G. König‐Langlo, E. G. Dutton, and A. Tsvetkov, 2009: Global dimming and brightening: An update beyond 2000. J. Geophys. Res., 114, D00D13, doi:10.1029/2008JD011382. Not that we need any more bad news, but N. Hemisphere snow extent for July 2012 was the lowest on record.